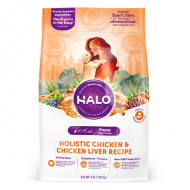 Halo Holistic Chicken and Chicken Liver Recipe for Puppies, 6/3 lb. Halo Holistic Wild Salmon and Whitefish Recipe for Adult Dogs, 6 /4 lb. 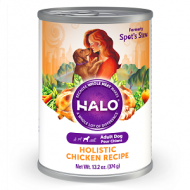 Halo Holistic Chicken Recipe for Adult Dogs 6/22 oz. WHOLE chicken, nourishing grains, and non-GMO vegetables. Formulated to support your adult dog’s strength and energy level. Halo Spot's Stew For Dogs, Succulent Salmon 12/13.2 oz. Halo for dogs is real all natural dog food made with only the freshest ingredients. Plus, our canned dog food formula has no added by-products, rendered meats or meals. Made with high quality protein, grains and fresh vegetables for superb taste and digestibility. 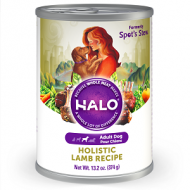 Halo Spot's Stew Recipe Canned Dog Food is ideal for all life stages. Optimum protein helps keep body toned and rebuilds body tissue. 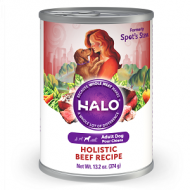 Halo Holistic Beef Recipe for Adult Dogs12/13.2 oz. WHOLE beef, nourishing grains, and non-GMO vegetables. Formulated to support your adult dog’s strength and energy level. Halo Holistic Chicken Recipe for Adult Dogs 12/13.2 oz.